These could probably look quite impressive, at least if you are a bit better at working with pastry than what I am. I'm sure some creative pastry-types could make some nice decorations to go on them - as well as making them look uniform and generally a bit nicer. They are fairly easy to put together and yet again - freestyle them to your hearts content. 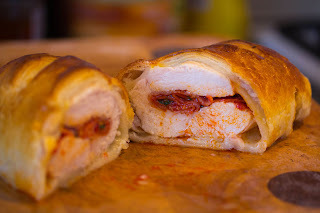 For example, I could easily see myself putting some cheese and ham in the chicken instead of the chorizo and tomatoes. After that little thought experiment - let's look at the recipe. Slice the chicken breasts horizontally along the length, making sure not to cut all the way through. Spread the chicken breast like a butterfly and press down with your hands to flatten it a bit. Put chorizo slices, chopped tomatoes and basil on the chicken breasts and season to taste. Roll up the chicken breasts. and put to the side while you prepare the puff pastry. Roll out the pastry to a rectangle of about 35 x 40 cm. Cut into 4 equal squares and pop a chicken breast onto each one. Brush the edges of the pastry squares with a small-ish amount of beaten egg (don't use too much or it won't seal properly). Fold the squares into small parcels and push firmly to seal. Flip the parcels upside down and put them onto a baking tray lined with parchment paper or tin foil. Cut some slits on the top of each parcel to allow steam to escape and brush with some more beaten egg. Bake in the oven for 20 to 25 minutes or until nicely golden and risen. This is another recipe that doesn't really take much time in the preparation stakes but gives quite a nice end result. You can scale it up and down as you please when it comes to servings. You can also select to make one big bake instead of baking it in separate portions as I did. As always - freestyle it to your hearts content. Choose some spicy sausages, change the herbs, use mixed tomatoes and so on. Give everything a good stir and top it all with the sausages. Bake in the oven for about 30 minutes. 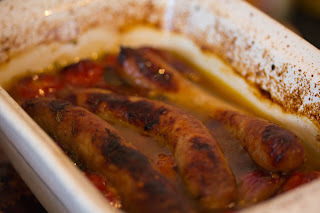 Remove from the oven, give everything a stir again, rotate the sausages and hoik it back into the oven. Bake for another 15 - 30 minutes or until the sausages are cooked to your liking. I'm not all that sure that this really is a casserole but that's what I'm going to call it. Yet again I just grabbed some stuff in the supermarket during lunch and made something out of it. As always I thought of and forgot lots of stuff that could have added some extra goodness to the dish. I wouldn't be totally averse to adding things like sliced red peppers, apple or even banana to this one. Yes, you read that right - banana. B - a -n - a - n - a. ;) For some reason me and my (so called?) 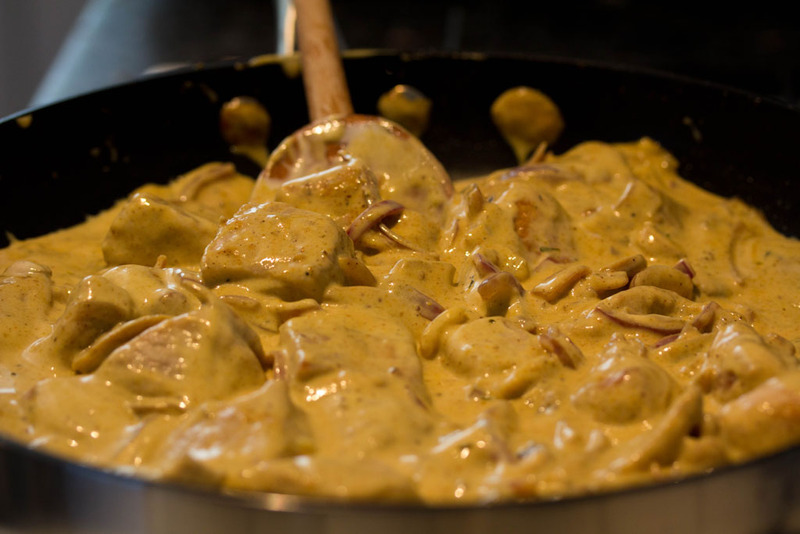 tastebuds are convinced that banana and curry powder goes really well together in savoury dishes. Each to their own and all that I guess. Even if you don't like the idea of bananas in this - freestyle it to your hearts content. This is another one of those dishes where you can empty out all your odds and ends in the fridge etc. 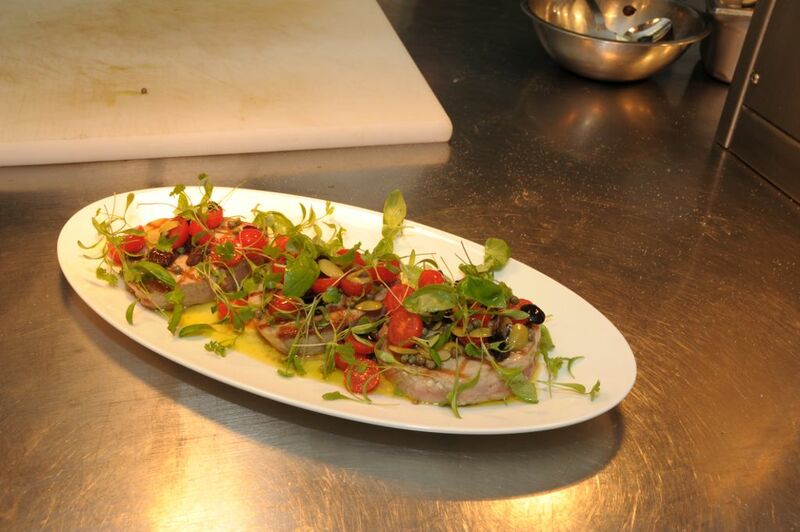 Why not stir in some fresh herbs just before serving? I served this with rice but you could just as well serve it with pasta or potatoes for example. Put the flour, salt and pepper into a plastic bag. Tip in the diced pork and shake well. Heat a frying pan on a medium heat. Once hot, add olive oil and the pork (make sure to shake of any excess flour) and fry the pork until browned on all sides. Remove the pork. Adjust the heat to low. Add the mushroom and onion slices and let them cook gently until softened, stirring every now and then. Add the curry powder after a couple of minutes and give it all a good stir. Once the mushroom and onion have softened to your liking, pop the pork back into the pan and stir in the creme fraiche and lemon juice. Let this bubble up and reduce a bit. Taste it and adjust curry/seasoning to your taste. I'm not sure what to say here since I'm feeling a bit embarrassed - I really don't feel comfortable in front of the camera, much less so a video camera. 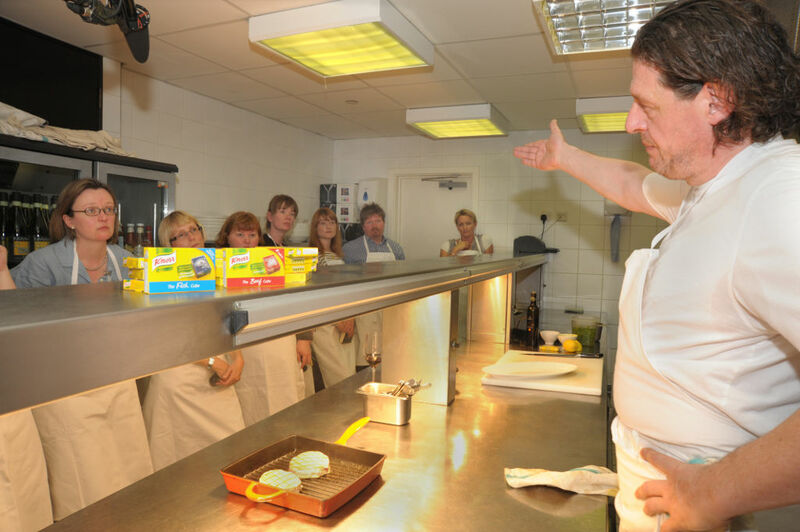 This video is from the masterclass with Marco Pierre White I have written so much about recently and I may or may not feature for a second or two. This is yet another recipe stolen from inspired by the Knorr Masterclass with Marco Pierre White I attended a little while ago. It is a fairly quick and easy way of making a very tasty tuna dish. One good tip is to make the 'nicoise topping' a bit ahead and let it sit and let all the flavours mingle together for some time. It's not a bad idea to let it get some sun so it heats up a little bit. I haven't specified any proportions as to how much you need for the 'nicoise mix' - let your own taste dictate what you do and how you do it. Like black olives more than green ones - have more black olives. Can't stand capers - leave the little buggers out. Freestyle it - that's the way forward! I served this with boiled Charlotte potatoes, something that went well with tuna steaks. Pop the tomatoes into a bowl, rinse (if you want to) the olives and capers then drain well and add to the tomatoes. Add olive oil and fresh lemon juice in quantities that suits your taste and stir well. Put to the side to let the flavours develop. Make a paste out of Fish Stock Cubes and olive oil. Spread some of it on one side of each steak. Let sit and marinade for a bit, why not about 20 minutes or so? Heat a griddle pan until you think it is far too hot. Then let it get a bit hotter. Add the tuna steaks to the pan, paste side down. 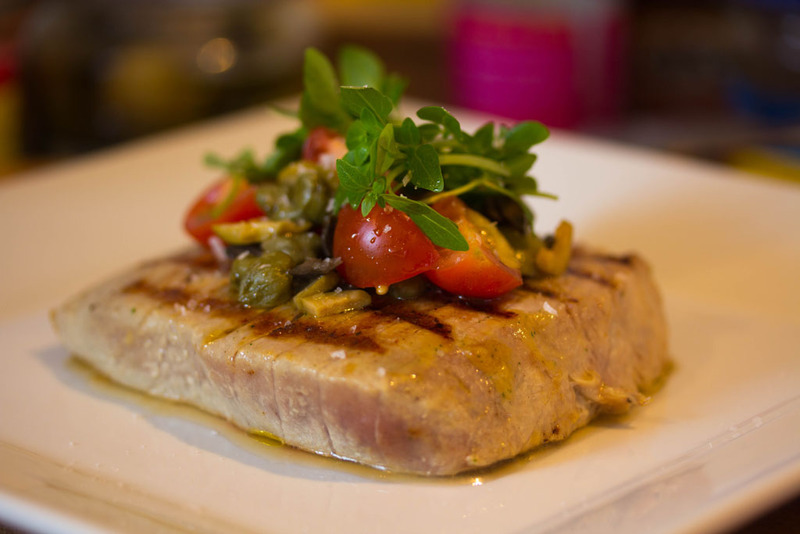 Spread more paste onto the 'un-pasted' side of each tuna steak. Let the steaks fry for about 2 - 3 minutes then flip them and give them about the same time on the other side. Or just adjust the time to suit you and your dinner guests. Put the steaks onto plates and spoon some of the nicoise mix onto each steak, making sure to drain as much liquid as possible first. Garnish with some fresh herbs and sea salt flakes. How the hell did I cook this? I guess this is what I deserve for leaving stuff unblogged for so long. This photo have been sitting in a 'draft post' for so long that I just can't remember how I cooked this dish. 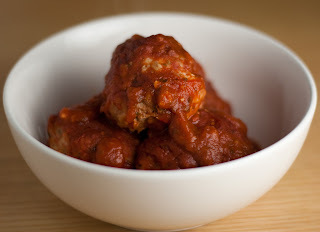 Meatballs, in some sauce, I think.... Not much of a recipe really, is it? I guess I'll try and remember what inspired me to cook it and get back with a recipe for it at some stage. 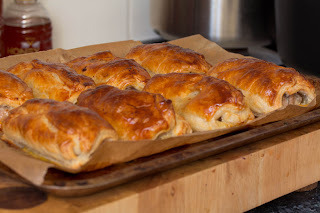 Sausage rolls, what a classic for the picnic. This is my version of making your own ones instead of buying them. As you can see from the picture I'll never be a pastry chef. I'm outright clumsy when it comes to dealing with dough and pastry. However, I forgive myself since they do taste quite good. I used chilli jam and Dijon mustard this time but you can chuck on anything you think will work instead. Or why not just trust the flavour from the sausage meat and the seasoning - freestyle it to suit yourself. This is simple, tasty, food at its best so I will not any more, let's look at the recipe. Mix the sausage meat well with the onion and sage leafs. Season to taste. Cut the puff pastry into 8 squares and if you are using chilli jam, Dijon mustard etc - spread some on the middle of each square. Portion out the sausage meat evenly in the middle of the puff pastry squares and brush one side with the egg. Fold together and crimp or push together to create a parcel of each one. Pop the sausage rolls onto a baking tray lined with parchment paper and brush each one with more of the egg. Bake for 25 - 30 minutes or until golden and cooked through. Allow to cool for a couple of minutes before removing them from the baking tray. 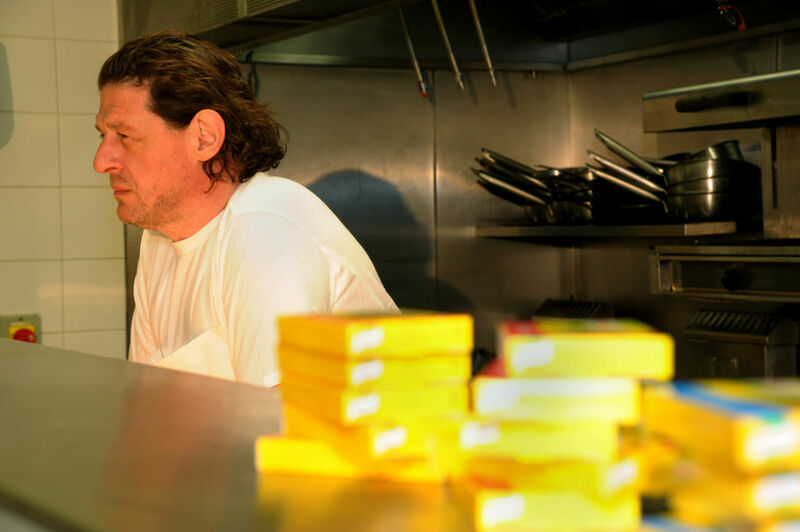 I need to get this out of my system, so: "I GOT TO MEET MARCO PIERRE WHITE LAST WEEK!" 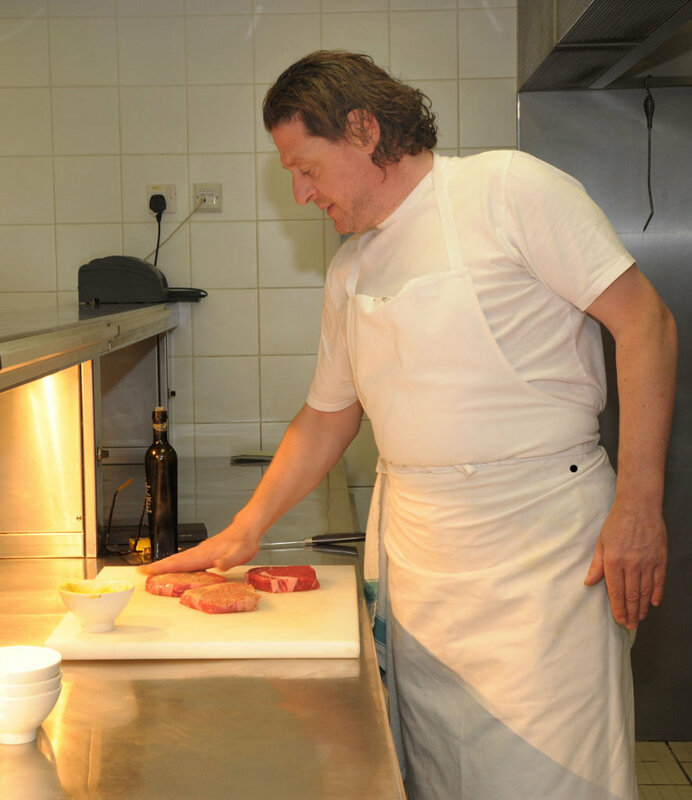 It all started with an email, asking me if I would be interested to come up to London for a days Masterclass with Marco Pierre White arranged by Knorr. Does the pope poop in the forest? Hell yeah is what I wanted to reply but I managed to contain myself and went for a more sedate - "yes, I would be quite interested in this". I was feeling quite excited as I got closer to the day. For me this is on the same level (if not higher) as watching NY Rangers in MSG with Mark Messier as my guide or going for a pub crawl with Willie Nelson and Hank III. Finally the day was here and I got on the train for London. Once I reached Restaurant Marco at Stamford Bridge I was welcomed and fed some coffee and canapés. A bit later I was introduced to Marco and we had a quick chat. Shortly after that we were all ushered into the kitchen where Marco proceeded to cook for us. During this cooking session he demonstrated how to make a paste out of Knorr stock cubes and olive oil and any herbs and/or seasoning you want. This is used instead of the traditional salt and pepper and gives a completely new dimension to the flavours you get. All the way through the demonstration he peppered us with tips and anecdotes, something I think we all appreciated. Once the demonstration was over we were treated to a very nice lunch where I was lucky enough to have Marco at my table. Something that gave me a chance to chat even more with him. To be honest, I didn't think much of this Knorr paste when I accepted the invitation - I mainly did it for the chance to meet Marco. Having tried what Marco cooked for us as well as having tried it on chicken and steak myself after the event I'm now converted though. I'll definitely use this on a fairly regular basis from now on. Playing with different combinations of flavour to try and get the best out of the dishes I cook will be quite fun. All in all I had a great day and I keep having different nuggets of wisdom pop up that was given to us by a very friendly and warm Marco. Besides Marco - I'd like to thank Jen, Neil and the rest for inviting me along. They probably don't realise what a big thing this was for me. ;) The same goes to Knorr for arranging this day. Another person who really needs a big mention is Roger - the man who Marco had running ragged fetching pans, plates, herbs and all other things that was needed during the cooking. Finally - none of these photos are mine. I was concentrating too hard on what was going on to even think about getting my own camera out. I was kindly given permission to use these 'official' photos from the event. This recipe is inspired by one of the dishes that Marco Pierre White cooked for me and some other lucky bloggers who was invited to a Knorr Masterclass the other day. I'm waiting for some of the pictures and videos from the event so I'll describe it in more detail in a later post. However, this is a recipe where I try to mimic the chicken dish that Marco prepared for us. The 'secret' to this is the paste you make with olive oil, Knorr stock cubes and spices and other seasoning. In this case there's lemon zest and thyme added to the paste. As I said earlier, I will describe the day a bit more in detail in a later post but there was one tip that Marco gave us that directly impacts this recipe. The secret behind getting really crispy skin when you cook chicken and duck breasts is to start with a cold pan. Pop some olive oil into the pan, breast skin down and keep it on medium heat. This renders the fat in the skin and makes it crispy. One of many top tips he gave us during the day. As you can see from the picture I still need some practise to get this right, but the skin was well crispy although it looks like I did fry it a tad bit too much. I was looking for supremes but could only find part boned breasts with skin on. The fact that the bone still was in there added to the cooking time. In a small bowl mix the stock cube(s) with some olive oil until a paste is formed. Add zest from the lemon to taste as well as some finely chopped thyme leaves - to taste. Add olive oil as and when needed to keep it as a paste. 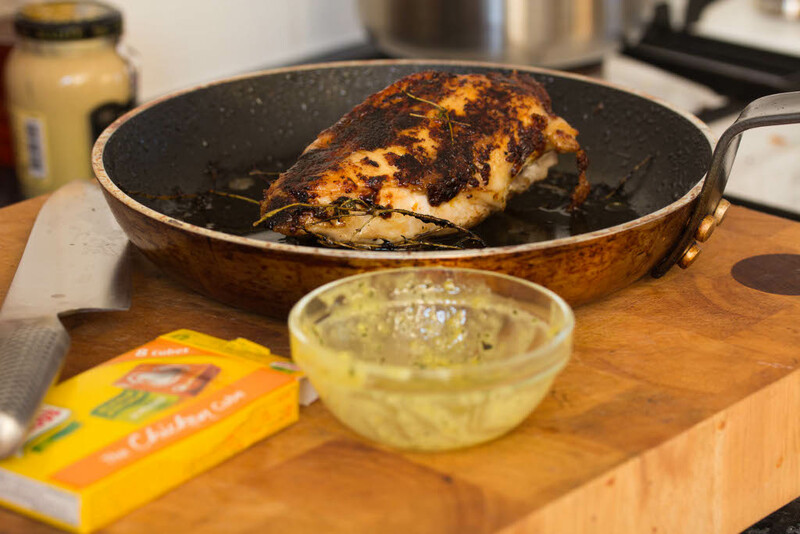 Spread the paste on the skin of the chicken breast, as thick or thin as you wish. You can let this sit and marinate for up to 30 minutes. 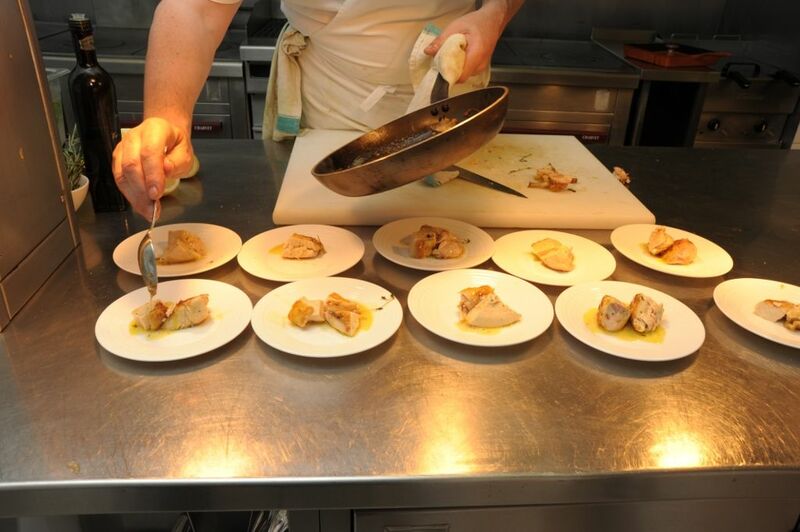 Take a cold frying pan and add a good glug of olive oil, followed by the chicken breast - skin side down. Fire the stove up on a medium heat and cook until you got a nice golden colour and crispiness to the skin. Flip the chicken breast and let it obtain a nice golden colour on the bottom side as well. Turn off the heat on the stove, chuck some of the thyme sprigs into the pan and pop it into the oven. Let it cook in the oven until done, about 8 - 10 minutes (or so) depending on the size of the breast. Half way through - add the juice from half the lemon. You can also flip the chicken breast again if you feel like it. I served this with some boiled new potatoes and a couple of spoonfuls of the pan juices. If the pan juices are too strong, add a spoon or two of water to dilute. I know that I've been bad and haven't updated this blog for a long, long time but it is soon time to do something about that. Work and other things have taken far too much time and I just haven't had the mojo to cook and blog. Keep your eyes peeled and you'll soon find some new material and maybe some layout changes as well.